Welcome to North Queensland and +Australia's premier motorcycle adventure company - experience the best off-road trails throughout +Cape York and +Tropical North Queensland with Fair Dinkum Bike Tours a company owned and operated by a local. Don't trust your trip of a lifetime with just anyone join us a company established for 13 years regularly featured in the major magazines, we are the only company to be endorsed by Stephen Gall, an Australian motorcycle legend. Fair Dinkum bike tours offers motorcycle adventure tours showing you the natural beauty of the +Daintree , +Cape Tribulation , Palmer River, Cape York and the Gulf Savannah, with a range of tours designed to cater for every requirement. 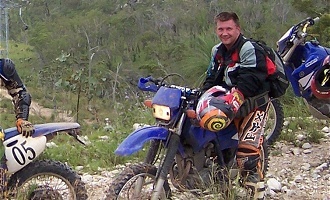 My name is Dave Williams I am the owner operator and accredited official for Motorcycling Queensland. I have competed in state enduro and motocross series. I have expert local knowledge and have been exploring far North Queensland for more than 35 years and will take you on an outback Aussie adventure of a lifetime.